Allegro MicroSystems (Allegro of the following abbreviation) announce in Czech republic capital Prague built a center of new research and development, center of this research and development has had two engineers at present, the innovation IC that these outstanding engineers will quicken Allegro to precede for car and market of industrial application development. This group is first will dedicated the sensor IC that is used at the sources of energy of electric car, green and application of efficient industry electric machinery at development. Allegro business development and Michael Doogue of vice president of advanced sensor technology express: We are very glad to center of new research and development can be opened formally in Prague, we also are honoured to be able to have a preeminent engineer group very much, this will strengthen Allegro to be in further the leadership position of car and industrial market, this center plans to be in in the near future inside invite again 20 to 30 engineers. Prague group is the important complement of group of research and development of product of Allegro whole world, I believe firmly in future a lot of this group will be right inside year the effect with very positive generation of the speed of product research and development of Allegro and client support level. Allegro decides to open center of new research and development in Prague basically was to consider place is in the outstanding resource of the respect such as knowledge of IC design, system and software engineer, prague area has seasoned engineer already, also have the graduate of near future of many place university. 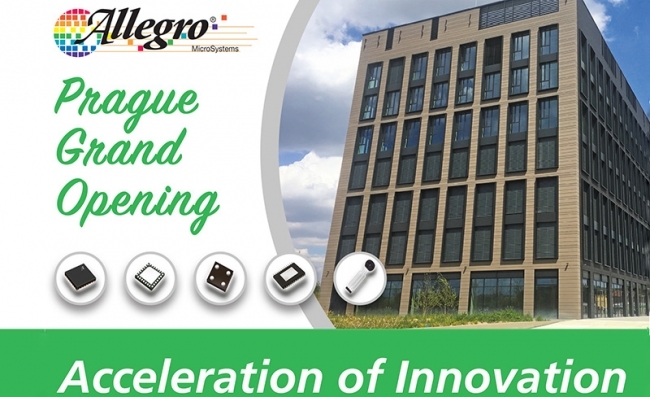 The working environment that Allegro is located in the center of new research and development of Prague to have modernization, top-ranking establishment and beautiful urban landscape, have all round walk perfectly and ran course and all-around the recreational facilities such as the coffee hall of the service. About the more information of center of this research and development, ask a visit: Www.allegromicro.com.